One of my new favorite stamp sets is in the new Holiday Mini Catalog called Gently Falling. Isn't that a great name! This is a Two Step stamp. If you are familiar with Stampin' Up! you will know the Two Step method. If you are not, let me explain. You stamp the background of an image in a lighter color ink and then stamp the detailed image on top in a darker color ink. Each image can be used separately, but when they are together, the image comes alive! 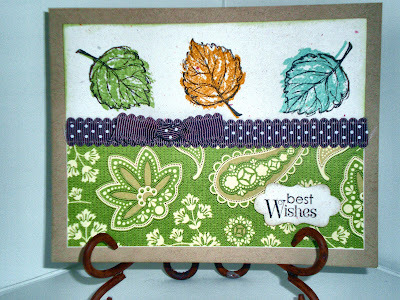 As you can see in the leaf print on this card, the color of the leaf is stamped first, then the detail is stamped on top. I used the Spice Cake Designer Series Paper which coordinates nicely with this set. I pulled the colors for the leaves from the paper. To Shop for these products, head over to my Online Store and click on the Holiday Mini Catalog.